Andrey Avdeyenko (b. 1963) became active as an artist since the 1980’s. In 1996 he opened The Palitra art gallery on the premises of his photolab. The gallery, where a number of significant art projects were exhibited, played an important role in the development of art photography in the city. It existed until 2005. 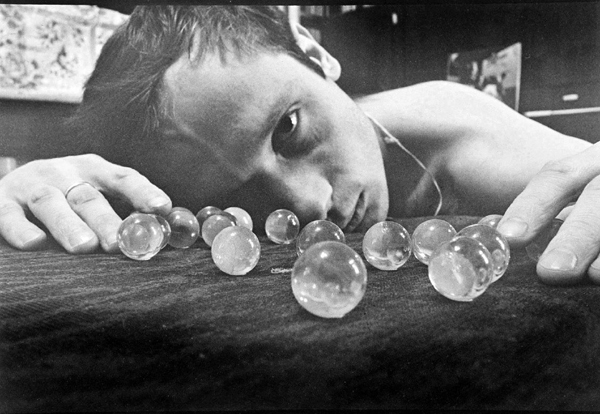 In his Glassballs series (1994) Avdeyenko photographed a handful of glassballs in a variety of different settings, thus producing a very integral and personal project. His work covered a variety of genres that ranged from still life to self-portraiture, and social reportage. Using these ‘found objects’ (the glass balls) allowed Avdeyenko to research a range of semantic possibilities resulting from the relationships constructed between the object(s) and their different visual contexts. An example of his later work is An Alien's Report on A 1998 Terrestrial Visit (1998), a series photographed from a moving car using a flash combined with a long exposure. This shooting technique accounts for the surrealist look of his night images. The project was exhibited in the Kharkiv Palitra Gallery alongside the humorous “alien's notes” by Alexey Yesunin.